« Too Late to Apologize – Jefferson Rocks! 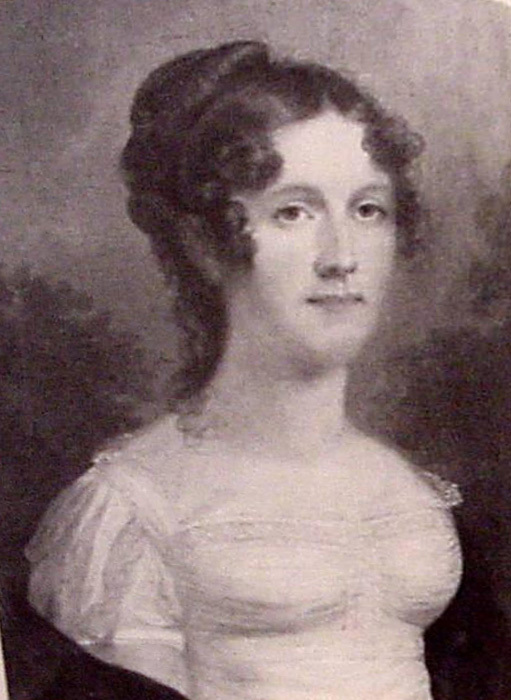 Julia Hancock Clark, portrait by John Wesley Jarvis. Courtesy Missouri Historical Society. Who doesn’t enjoy a “how we met” story? There is a charming story about how William Clark met his future bride, a year or so before the Lewis & Clark Expedition. Hancock family legend has it that young Julia “Judy” Hancock, who was about 11 or 12, and her cousin Harriet Kennerly, age 14, were out riding near their handsome family estate, Santillane, in western Virginia. One of their horses became balky, and the girls were having trouble getting home. Along came a handsome red-headed gentleman — none other than William Clark — who helped the girls get the horse going and escorted them home. Little did the pretty young girls dream that they had both met their future husband. We’ve written previously about Julia’s father, a tough and very wealthy Revolutionary War veteran (see Buried Sitting Up and a Fed to Boot for more details). Suffice to say that Colonel Hancock’s daughters and nieces were highly sought-after Virginia belles. Though we may recoil with a certain ick factor today, it wouldn’t have been at all unusual if William Clark — then just past 30 years old — had expressed an interest in Julia to her father, in spite of her young age. 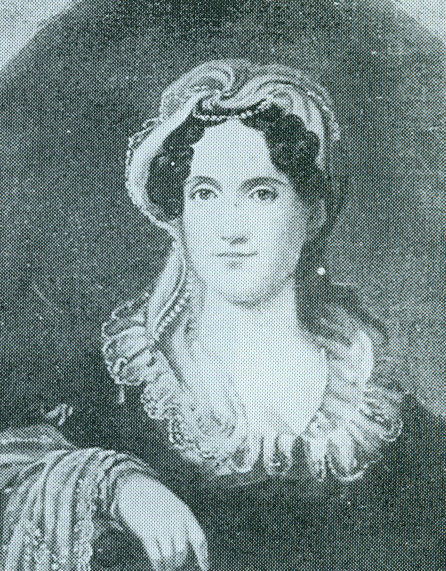 In those days, women of the gentry class on the frontier were often married off very young in those days after fierce competition from multiple suitors; Clark’s own mother, the redoubtable Ann Rogers Clark, had been a bride at 14. It appears that Colonel Hancock did not give his permission to Clark to court young Julia right away, but he apparently looked favorably on Clark’s interest in his daughter. In effect, the colonel seems to have made it clear to Clark that if he could establish himself financially (something that he had yet to do due to a multiplicity of family troubles), he would give Clark a chance to court his daughter when she was a bit older. Thus, not the least of William Clark’s incentives for joining Meriwether Lewis on the Expedition would have been the opportunity to secure fame and fortune so that he could have a fighting chance of winning Julia for a wife. There is evidence that he thought of Julia during the Expedition with the naming of the Judith River in her honor. What is undisputable is that Clark made a beeline for Fincastle County upon his return from the West and began courting Julia. They were married in early 1808, when Julia was 16 and Clark was 37. By all accounts the marriage was a happy one. The couple lived in St. Louis, which as a frontier village was a far cry from life at Santillane. Nonetheless, Julia — noted for her love of music and Shakespeare — learned to cook and run a household. Clark writes frequently in his letters with tender concern and pride about her life, from her cooking and canning to her pregnancies to her battles with mosquitoes. By the time she was 28, Julia was the mother of five children, the last of whom, John Julius, had a serious deformity believed to have been spina bifida. She was also gravely ill herself. From Clark’s letters, it is difficult to determine what had happened to shatter Julia’s health. Some of the symptoms Clark describes sound like breast cancer, while others sound more like tuberculosis or some other lung ailment. Julia went home to Virginia and the Hancock family estate (now moved to Fotheringay in Montgomery County) in hopes of recovering. Instead, she died there in the summer of 1820. Needless to say, Clark was devastated. He was now the father of five orphaned children ranging in age from eleven to two. Again Clark took the traditional path of a man of his place, time, and social station. He looked around for a nice widow woman with whom he could join forces. And that was how he became reacquainted with that other little girl from the long-ago horseback ride. Like Clark, Harriet had come to know sorrow. She had been married at age 18 to John Radford, an aspiring doctor. In something of a break from tradition, Radford was about Harriet’s age. The two had three childen and appeared poised for a long and happy marriage when Radford met with an unthinkable hazard of pioneer life: he was attacked and killed by a wild hog while traveling through the Kentucky wilderness. Harriet had moved to St. Louis to live with a brother, where she and Clark met again. They were married in late 1821. Clark seems to have been both a good judge of women and an affable, easy-to-get-along-with man, for again all accounts indicate that he and Harriet had a happy marriage in spite of the trials and sorrows of life, which included some hard blows indeed: Mary Margaret, Clark’s daughter by Julia, died at the age of seven, and Julius died at the age of thirteen. William and Harriet had two sons together. Jefferson was healthy and strong, but Edmund died when only a year old. Clark and Harriet also had family troubles that seem more humorous now but probably weren’t at the time. Clark’s oldest son, Meriwether Lewis Clark, called Lewis within the family, fell in love with Harriet’s daughter Mary. Unfortunately, the feeling wasn’t mutual, and Mary proceeded with plans to marry Stephen Watts Kearney, a young soldier who would go on to fame as a leading military officer in the Mexican War and on the California frontier. Lewis was a student at West Point when he learned of the planned wedding, and raced to St. Louis in time to burst into the church as the ceremony was underway and proclaim his love for Mary to the entire town. The wedding was rescheduled and doubtless the people of St. Louis had something to talk about for a good long while. Harriet herself seems to have died rather suddenly on Christmas Day, 1831, at the age of 43. Again surviving letters do not give much clue as to what happened. Clark biographer Landon Jones speculates that infectious disease may have simply carried her away. In any case, Clark, a widower again at age 61 with an eight-year-old son, did not remarry a third time. A writing note: the age difference between William Clark and Julia, who is a major character in To the Ends of the Earth, posed quite a writing challenge. We finally decided to just explore these characters with as much compassion and insight as we could and let the chips fall where they may. We ended up loving the way this part of the story turned out; it brings a tenderness, humor, and drama to the story that would not otherwise exist. As we saw it, Julia is still just a kid in many ways. She’s been sheltered all her life, first by her father, then by her husband. She is not accustomed to making decisions on her own. Her life has changed radically in the year and a half between her wedding and the opening of the story. She left her father’s house, got married to an older man with a prominent position in society, moved to the boonies of St. Louis, became mistress of her own household, and had a baby. It wouldn’t be surprising if she sometimes wishes she were back in Virginia, playing with her sisters. It’s fair to say Julia loves, adores and worships Clark. Clark came along about the time she hit puberty, and she has never dreamed or fantasized about any other man. She’s proud that she was able to give him the son he always wanted. At the same time, Julia is beginning to understand Clark as no one ever has before. This marriage is still new, but Julia is starting to see the vulnerabilities in her husband, beyond the macho exterior to the big, loving heart of the man. In the course of the story, her maturity and her ability to help her husband is tested in ways she could have never imagined. Very interesting! It seems to me that Lewis Clark’s incident with Harriet’s daughter’s wedding is rather reminiscient of his namesake’s ability to get the whole town talking. Perhaps if Meriwether Lewis had done the same things may have turned out differently; he could have convinced a woman to marry him…or gotten shot by the husband-to-be. Mary was his step sister. Our entire book To the Ends of the Earth is about what happened to Meriwether Lewis after the expedition and goes into this subject about the motivations behind his death. As for his being gay, we have a post about that which you can read on this site at: https://franceshunter.wordpress.com/2009/11/09/was-meriwether-lewis-gay/. This was fascinating. Excellent. And I didn’t know some of it. Have you done anything on William Clark Jr. and his adventures founding Churchill Downs (home of the Kentucky Derby)? He was a bit of a rascal. Also if you are interested in the Churchill Downs History connection it was originally called the Louisville Derby Club changed to Churchill Downs later. Yes, I was confuzzled with the names AGAIN. Thanks for the tip on trying Louisville Derby Club instead of Churchilll Downs. Is your research online somewhere? Some of my research is online but its still in progress so its not to the sharing point yet. I do have a family tree on Ancestry.com for Meriwether JR go ck that its VERY interesting I have pictures and some stories. Kandis, Julia’s younger brother George could not pronounce Julia when he was a child so he called her Judy. It stuck. William Clark, btw, named the river the Judith because he thought that was Julia’s given name. According to family history, Clark didn’t realize it was Julia until the day they got married, because everyone had always called her Judy. Hunter sisters, I love this blog! I’m learning so much from your research and explorations and am waiting for your books. I hope you don’t mind if I share the family’s version of the Mary Radford / Meriwether Lewis (called Lewis) Clark wedding story, where Mary married Major Kearney. While not quoting entire passage, I’ve taken the information from their cousin William Clark Kennerly’s memiors, “Persimmon Hill,” page 107-108. “The day finally arrived, and the house was beautifully decorated with flowers. Extensive preparations had been made for the supper. The wine was being iced and the wedding cake was waiting to be cut by the Major’s sharp sword. The guests had assembled in the large rooms, which were lighted by myriads of wax candles. A screened orchestra was waiting to play the weddig march – but no bride came down the broad stairway. The musicians improvised with suitable music. The guests waited; they knew the groom as there…. What they did not know was that Meriwether Lewis Clark had also come, claiming he had not heard of his cousin’s engagement, and was at the moment upstairs in her room, pleading with her while poor Major Kearney paced up and down in the hall outside. Finally the guests were told that the bride was ill and that the wedding was postponed and would take place the next day. I’m not sure where the church story came from, but six year old William Clark Kennerly was there and remembered all the beauty of the house on that day but only learned of the behind the scenes drama from his father’s diary. I’m also researching Churchill Downs. Salli, thanks so much for the excerpt from Persimmon Hill. That book is one that I don’t have yet, but want to get. It sounds fascinating. The account of Lewis bursting into the wedding comes from John Bakeless’s book “Partners in Discovery.” I know Bakeless interviewed a number of descendants so it would be interesting to know who was right! Thanks SO MUCH for posting and for ordering our books. We love our Clark family genealogists on this site and always welcome your comments and additions. These excerpts on the Hancock’s have been very interesting for me to read! I have been researching my family, and my husband’s family, and I live in the Botetourt / Roanoke area as well! We have all grown up hearing stories of the old man buried standing up, so imagine my surprise to find out tonight that Col Hancock is actually my husband’s 3rd cousin! (7x removed of course!) And Santillane…I drive by that place often, and when it was for sale, I so wanted to buy it. If I would have known the family connection then….well…. 🙂 Thank you so much for your wonderful blogs. I will be keeping watch for more great posts! Hi guys! I thought I might mention that one of the more recent biographies of William Clark clears up the “thinking of Julia” on the expedition issue. Apparently, the river named “Judith” was changed to Judith AFTER the expedition returned since the map was not published right away. That gave Clark time to return, meet Julia again, become engaged, and then re-name river after his betrothed/wife. I believe it was in “William Clark and the shaping of the West” by Landon Jones, or “Wilderness journey : the life of William Clark” by William E. Foley. I can’t remember which one, because I read several at the same time (and my memory is shot). It gets even better as told by my Grandfather. Harriet’s brother marries my Grandmother, 6th genneration, they have a daughter who marries a Glasgow. Two of Glasgow’s sisters marries two of Clark’s sons. I was doing a genealogy search for Judith Hancock and found this great story. I am distantly related. Thank you so much for your study and interest in this family. Joe, James Holmberg says in his book “Dear Brother” that William and Julia were married in Fincastle around January 5, 1808. I hope that if anyone has more details they will post them here. I think they were married at Julia’s home–I’d be hard pressed to say where I read that, since I’ve read so much on Lewis and Clark! Could have been in William Foley’s Wilderness Journey: The Life of William Clark, since I read that recently. I hope that helps! Hello all! My mother has recent found in her genealogy/ancestry research that my family via her mother’s side (my grandmother) are related to the Clark family. Meriwether Lewis Clark is my “cousin of mine and his father General William Clark is a ‘great’ uncle of mine. General William Clark’s brother (General George Rogers Clark) is my 6x great grandpa. So COOL! I’m related to this famously historic family. Hi Mary, but I think if you do some reading, you will find General George Rogers Clark never married. He was bankrupted by the resulting lawsuits from his Revolutionary War actions, and suffered from severe alcoholism. Perhaps you’re decended from their other brother Jonathan Clark? He was a prosperous plantation owner and Revolutionary War veteran who settled in the Louisville KY area. Either way, very cool to be related to the Clarks. This is the linage that was given to me by my grandmother Margaret (Eleanor)Daigh Clark. Can you fill in the wife of John O’Fallon Clark. John O’Fallon Clark + ?? William Clark at some time in his life – “married” my grandfather’s great grandmother and they had at least one child- “Eliza Clark” who was raised with the Cherokees. Eliza Clark, known in my family as “Grandma Clark” harbored a life long bitterness toward white people and according to my grandfather, his grandmother (Grandma Clark) scalped a white man up in Kansas during the 1840s. Can anyone shed any light on this story? Thank you. Hi Joe, I’m not a historian, but I have read quite a bit on both Lewis and Clark. The answer to William Clark taking an Indian wife is technically a “no”, however, legend has it that during the expedition he did have “a companion” while staying with the Nez Perce on the return journey. The resulting son, Halaftooki (Daytime Smoke), always maintained he was son of William Clark. There seems to be some validity to his claims as the timeline fits. Clark would have been unaware of his birth at the time. It’s possible he learned later, because he did meet with the Nez Perce much later in life. There is certainly no account of it in the expedition journals or any acknowledgement by Clark himself. Google “Halaftooki” if you would like to read more about it. There is even a photo of him in his old age. I personally think he was likely the son of William Clark, but don’t believe the stories of Lewis taking a wife and fathering a son during the expedition. I believe the child from a Sioux woman named Winona, Joseph Lewis DeSmet, was possibly the son of Reuben Lewis (Meriwether Lewis’ brother). There are too many facts that don’t line up for him to be Meriwether Lewis’ son. It’s been awhile since I last posted here and yes, Julia Hancock was married at Fincastle. Her name was never Judith. She was baptized Julia, but was called “Judy” because her youngest sibling was unable to pronounce “Julie” and called her “Judy.” I would have loved to see the look on Gen. Clark’s face when he first heard Judy’s given name, “Julia” as they took their vows. It must have been priceless. After Julia died, the General then married her first cousin Harriet with whom he had more children. Much of the General’s private family life in Saint Lewis is recorded in “Persimmon Hill.” You might be able to find it in a library or through various out of print book website’s like Abe’s Books or Alibris.com. Sorry about the “Saint Lewis”…my nephew’s name is Lewis, the hour is late and I should know better since i lived in St.Louis for two years.